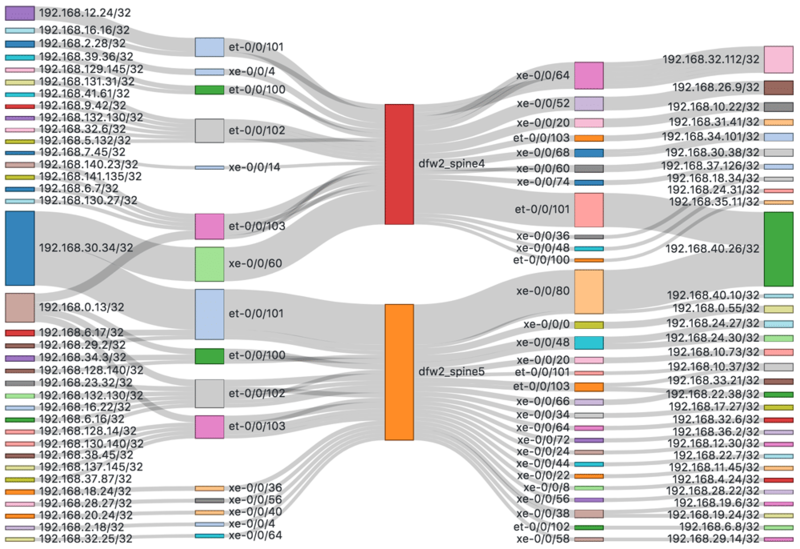 Understand relationships in network traffic data using Kentik Detect’s Sankey diagram visualization. Sankey diagrams have been around for more than a century. The first one, drawn by Captain Matthew Sankey in 1898, was used to show the energy inputs, outputs and efficiency of a steam engine. In general, a Sankey diagram is a type of flow diagram where the width of the bands represent the proportional quantity of flow distributed over one or more dimensions. 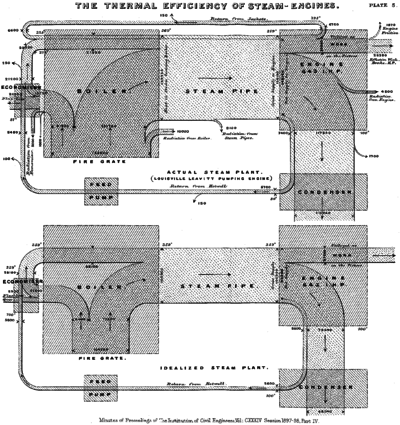 In the case of Captain Sankey’s original diagram, the “flow” is steam, and the dimensions are steam production and steam utilization. 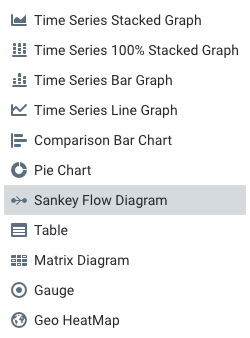 Sankey diagrams have since been adapted for many other uses to show flows of energy, materials, revenue, and more. We often see network data presented in time-series visualizations — line graphs that indicate how traffic volume varied over time. Multi-line or stacked graphs can show how traffic is split over a single additional dimension. Time-series displays can’t easily show the traffic volume relationships among multiple dimensions, though, and this is where Sankey diagrams really shine as a way to visualize traffic flows in IP networks. Showing how traffic volume is distributed over multiple dimensions makes it easy to spot significant relationships between different aspects of the traffic, for example, how traffic sources are related to traffic destinations. Kentik has made wide use of the Sankey visualization type in our Kentik Detect® network traffic analysis platform, starting first with our Peering Analytics feature in 2015, and then later as a general purpose visualization type in the Data Explorer. 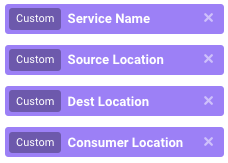 For more information on Peering Analytics, check out our previous blog and for Data Explorer, check out our Knowledge Base article. 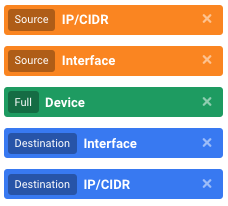 You’ll notice that the dimensions order (left to right) matches the order that was set in the Group-By Dimension selector — in this case, Source IP/CIDR, Destination IP/CIDR and Destination Protocol:IP Port. 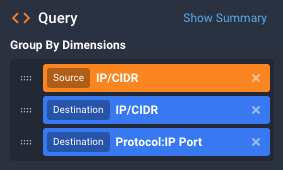 The connecting bands make it easy to see, for example, which destinations the source IP 10.0.6.3 was talking to, which services were in use for those connections, and the relative traffic volume represented by the width of the band. Visualizing network traffic this way makes it very easy to see top contributors for use cases like pinpointing root causes of congestion. 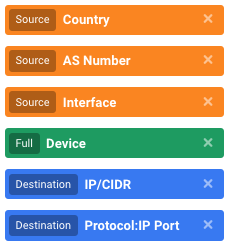 Mousing over the different parts of the diagram highlights individual components, and reveals discreet traffic volumes in a tooltip. 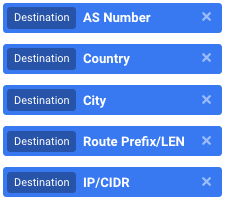 For companies that sell IP transit services, questions often come up about the load individual customers place on different parts of the network, especially in relation to revenue from each customer. 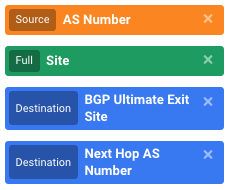 Specifically, operators want to know where customers’ traffic enters the network, where it exits, which adjacent network(s) it exits to, and how far it is carried. For these providers, the answers lead directly to the cost per customer. A similar use case appears in enterprise networks, to understand how different departments, groups or services utilize the network. 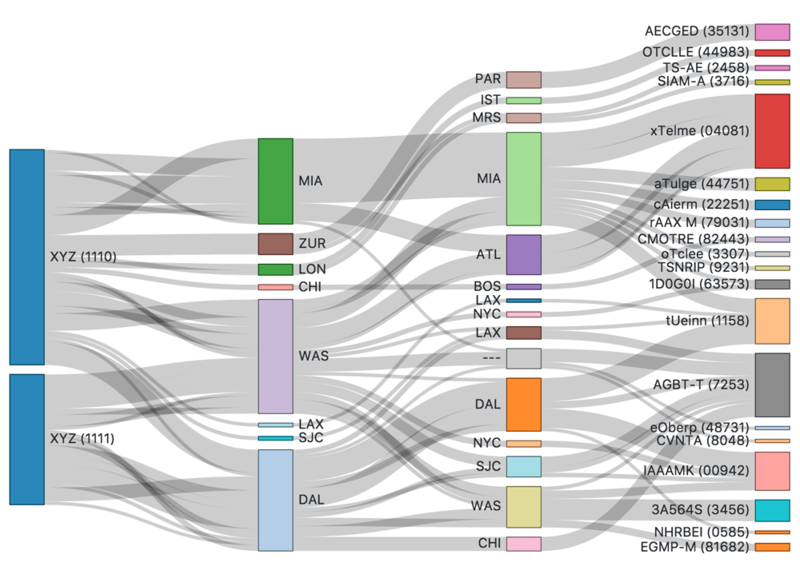 Once we run this query, we get a great visualization like the below, which makes it easy to see exactly where Customer XYZ’s traffic enters the network, where it exits, and which adjacent network it exits to. Once we click the blue Run Query button, we get a chart like the one below. This kind of visualization provides instant situational awareness about how the attack is affecting the network and informs fast decision making about the appropriate response. A query like this will result in a visualization that looks something like the image below. 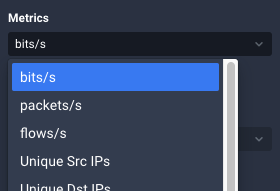 Congestion top contributors are easy to spot because they stand out as the biggest bars. Not already a Kentik customer? Start leveraging the powerful visualizations in Kentik Detect today by requesting a demo or signing up for a free trial.